I don’t make dessert very often because there are only two of us in the house (and who needs THAT kind of temptation?? ), but when I have company I like to make a dessert or two for my guests. 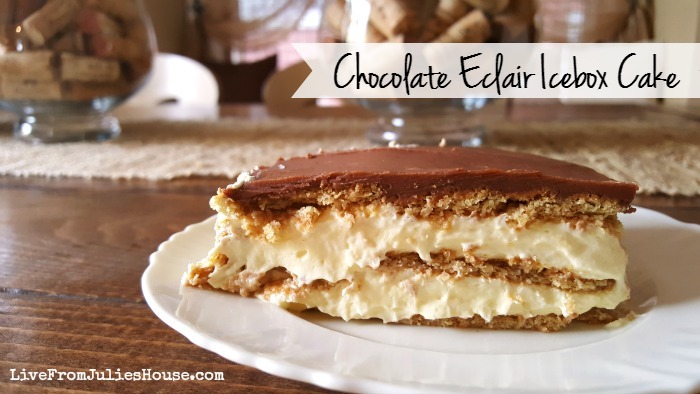 I had my family over for a cook out last week and I made a recipe that my mom shared with me a few years ago – Chocolate Eclair Icebox Cake. My favorite recipes are easy, no fuss creations that everyone loves, and this one fits the bill perfectly. Plus, who the heck wants to turn on the oven when the weather is warm? NOT ME. 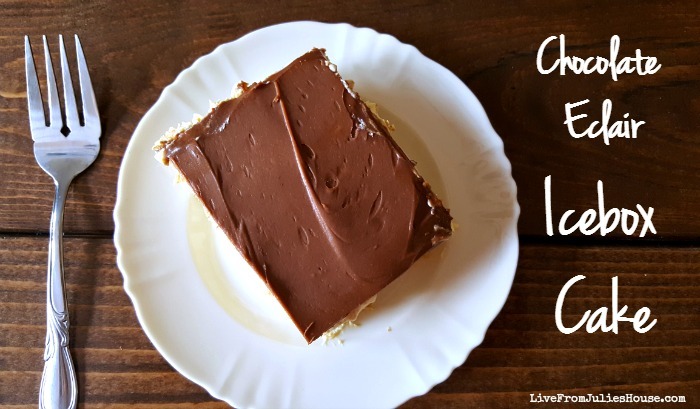 Personally, I think icebox cakes might be the perfect summer dessert and this one is simple to make and absolutely delicious…and it really does taste like a chocolate eclair. This easy, cool and creamy icebox cake is a real crowd pleaser, and you don't even have to turn on your oven! Butter the bottom of a 9 x 13" baking pan and line with graham crackers. Mix the milk and pudding for 2 minutes on medium speed, then blend in Cool Whip. Pour 1/2 the mixture over the graham crackers, then place a 2nd layer of graham crackers over the pudding mixture. Pour remaining pudding mixture over graham crackers, then cover with a 3rd layer of graham crackers. Refrigerate for 2 hours. In a small saucepan, melt the chocolate and add the Karo syrup, vanilla and butter. You can melt the chocolate in the microwave if you don't want to turn your stove on . Mix in powdered sugar and milk, blending until smooth. Spread chocolate mixture over cake and refrigerate at least 6 hours, preferably overnight. I’m linking this project up at some terrific blog parties – you can find my complete list of places I party HERE. I love it when you share my posts! Please keep in mind that all images and text on this site are property of Live From Julie's House. Feel free to use one photo provided that a link back to my original post is included. Please do not remove any watermarks, crop, or edit any of my images without first obtaining written permission from me. Pinning is always welcome and much appreciated.